This is another Middle eastern treat. 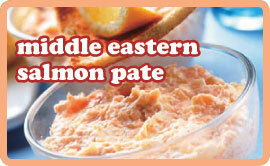 It’s a delicious salmon pate which I ate at the same dinner party as the Palestinian Chicken. It’s really great with pickles and bread. I’m a greedy pig and ate almost all of it while other guests chatted. Soak the bulghur wheat in warm water for 20 minutes. Drain and set aside. In a food processor, or with a hand blender, blend until smooth the onion, capsicum, mint and basil. Add the bulghur, and blend until smooth. Add the salmon, salt, pepper, kabseh and 1/2 the lemon juice and blend until you have a smooth paste. Taste for seasoning and add more salt and lemon juice if neccessary. Spread on a plate and drizzle over some olive oil. Serve with flat breads and pickled turnip, cucumber and chillies.